Electricity use is growing worldwide, providing a range of energy services: lighting, heating and cooling, specific industrial uses, entertainment, information technologies, and mobility. Because its generation remains largely based on fossil fuels, electricity is also the largest and the fastest-growing source of energy-related CO2 emissions, the primary cause of human-induced climate change. Forecasts from the IEA and others show that “decarbonising” electricity and enhancing end-use efficiency can make major contributions to the fight against climate change. Global and regional trends on electricity supply and demand indicate the magnitude of the decarbonisation challenge ahead. As climate concerns become an essential component of energy policy-making, the generation and use of electricity will be subject to increasingly strong policy actions by governments to reduce their associated CO2 emissions. Despite these actions, and despite very rapid growth in renewable energy generation, significant technology and policy challenges remain if this unprecedented essential transition is to be achieved. 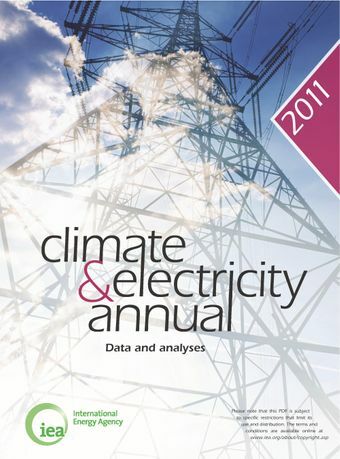 The IEA Climate and Electricity Annual2011 provides an authoritative resource on progress to date in this area, with statistics related to CO2 and the electricity sector across ten regions of the world. It also presents topical analyses on meeting the challenge of rapidly curbing CO2 emissions from electricity, from both a policy and technology perspective.